I’m the type of person who loves the idea of being extremely organized. However, I can’t seem to get to a place where I’m 100% happy with the state of my room and the general life to-do’s that float around in my head and never get done. I know some people who are naturally so on top of their game all the damn time. It just so happens they are also partly neurotic. Fortunately, I can say that I’ve strived for good organizational habits since I was a little lady in elementary school. And that in turn has helped me become the semi productive person I am today. Because who am I kidding…I could definitely be more productive. When I was younger, I had a small chalkboard near my bedroom where I’d write down all of my to-do’s. I’d put a nice fat check mark after I was done completing anything on my list. And the satisfaction I got from doing that was all too real. On my list, you’d probably find items like do homework, shower, eat dinner and buy new skirt from Limited Too. Thrilling. I have to be honest though, my chalkboard to-do list was a big part of my childhood and I oftentimes miss it. Now that I’m getting older, the balancing act that is life seems to be rearing its ugly head. Here are some tips that make staying organized a little bit easier because it doesn’t hurt to be reminded every now and then. To-do lists will help you get stuff done. Period. I think part of the reason for this is because you physically see everything you need to do written down on a piece of paper or maybe on a chalkboard, ha. Your to-do’s are not just fleeting ideas in your mind that you can save for a rainy day. Get your act together. I promise you’ll feel satisfied with every ✔. 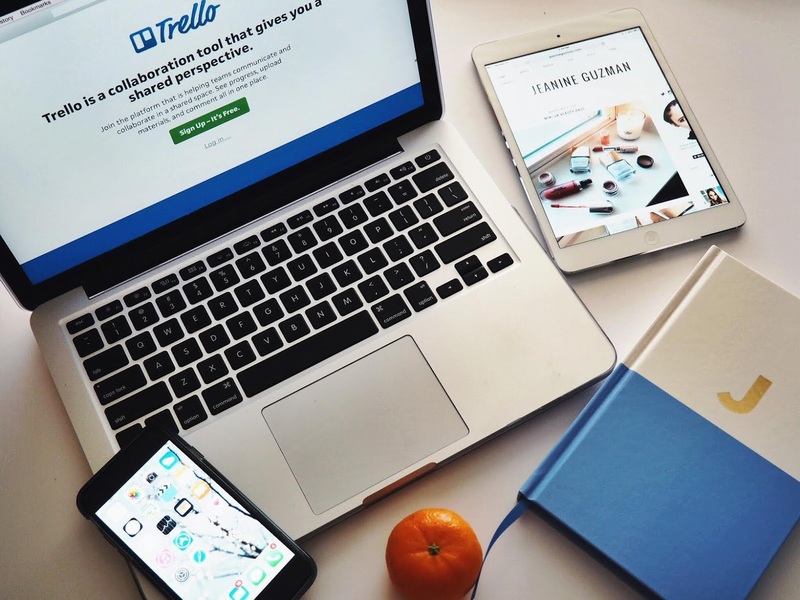 You may haven’t heard of Trello and if that’s the case, I suggest you check it out. Trello is a web-based project management application. I love using its built-in calendar to set deadlines for myself. The best part is that it’s free and also a great solution if you’re not the pen to paper type. Sacrifice your precious date with Netflix. If Netflix and chill is a consistent routine of yours, you should consider the fact that your date with Netflix would probably feel more special if it didn’t happen after work every night. Maybe take some time during the week to work on any side projects or even tidy up your apartment or bedroom. It will free up your weekend time, which is meant to be more fun anyway! I like to take 10 minutes from my Sunday morning or evening because that’s usually when I’m feeling the most relaxed during the week. Planning ahead may take the form of lists, reminders or even mental notes in your head. Since I’ve launched my blog, I’ve had to learn how to plan ahead better. Making sure I have new content to share on a weekly basis takes some pre-planning when there’s a full-time job, after work activities and weekend plans involved. Tidy room, tidy mind. It’s probably all in our heads, but I think that saying really rings true. I’m at least a good 50% more organized and productive in life when my room is somewhat organized. It’s never spotless, though. I like to think someday I’ll get there. Put your phone down for an hour without reaching for it. You might be surprised at how much you can accomplish when you’re 100% invested in whatever it is you’re doing. I know our phones are practically third arms nowadays, but it’s nice to be away from Facebook/Twitter/Instagram/Pinterest etc. every now and then. Any off-the-cuff ideas or to-do’s that pop into your head should go straight into your iPhone notes. I really do appreciate all of the random notes I have in there that help me to stop procrastinating.